Working together minimizes the costs associated with drafting a legal separation agreement. 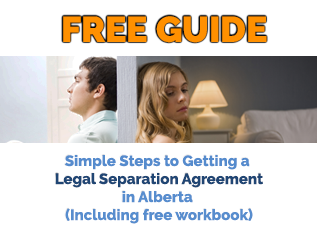 Obtain your Separation Agreement the friendly and affordable way! Please check out our topics below or scroll through this web page for all of your answers. Who can use our legal separation agreement services? still provide you with the benefit of receiving legal advice from your lawyer. We interview you by telephone. the custody, access, and support of children. We book an appointment with you and your spouse. Most initial appointments last from 2 to 2.5 hours. We will email you a list of documents to bring to the appointment. We create the first draft of your legal separation agreement before your first appointment. During the first appointment, we go through the agreement from beginning to end and edit it. You leave the meeting with a drafted legal separation agreement. We recommend that you review the agreement again after the initial appointment because it is hard to focus on the fine details in a meeting setting. Further issues may have been brought up during the appointment that you have not yet have had a lot of time to reflect upon. Make note of the changes that you’d like to see made to the agreement. Sometimes you’ll need to review the agreement with the banker, for example, to ensure that the parties qualify for refinancing. For parties with business interests or complex financial situations, they may need to consult with their financial advisor on tax implications. We then revise the Separation Agreement based upon the changes you want, taking into account your personal wishes and information received from the banker or financial advisor, if relevant in your particular case. You and your spouse then review and sign the legal separation agreement with your lawyers. We have a list of lawyers we can refer or you can find your own lawyer. If upon the advice of your lawyers you wish to make further changes, we charge $125 per hour for subsequent revisions. Lawyer fees are in addition to our drafting fees. Lawyers will charge for every visit. The goal is to minimize the back and forth between lawyers and keep your legal fees to a minimum (BUT you still get the benefit and protection of legal advice). Many of our clients only need to go to their lawyers once. Very few cases become contested when clients are willing to work collaboratively. If applicable, land transfer(s) and the divorce application are coordinated at the same time. Can You Use Our Legal Separation Agreement Services? There are no complex issues; for example, those involving disclosure, trusts, and complex business valuation. Is it Possible to Still Use Our Services Even if Not in Full Agreement? Yes, you can still use our services even if you are not in full agreement. However, it is essential that you both are willing to work together to reach an agreement. Often, couples can not agree simply because they have not completed a proper spreadsheet showing the division of property, assets, and debts. Once presented, it is interesting how this clarity enables the parties to reach an agreement. Most couples, if they are willing to work together, often reach an amicable agreement without having to resort to filing a court application. We are not lawyers; we do not give legal advice, nor do we mediate complex issues. However, we can still help in many situations, even if you are not in full agreement. Deborah Ward, owner of the Canadian Legal Resource Centre Inc., has personally drafted over 1,000 Separation Agreements, each of which has been audited by two different lawyers. As a result, Deborah has a great deal of insight and experience with the drafting of high-quality separation agreements. Though we cannot give legal advice, you will benefit from our substantial experience. Our greatest skill is to help the two of you to focus on results. We ensure that you maximize the quality of your time and investment with your lawyer by helping you summarize the facts surrounding your situation for quick and easy review. $100 to $1000 extra if you have a complex situation (ie. involving multiple projects, large investment portfolios in multiple locations, inheritances and other exemptions that are mingled with matrimonial property, business interests, etc.). $125/hour mediation or editing fees if you are having a difficult time reaching an agreement or require additional changes after consultation with your lawyer. To learn more about Uncontested Divorces, select the link: “Uncontested Divorces”. We are here to answer your questions! Click the button below to view our contact information.